A large Sandvik stacker/reclaimer was needed for the expansion of coal export operations at Ridley Terminals Inc. For the transport from China to Canada, the project cargo ship HHL MACAO was selected which required the stacker/reclaimer to be shipped partly disassembled. The heaviest part, the portal, weighed 560 t. Argonautics Marine Engineering, Inc. provided the initial lift plan, stowage plan, design ship motions and accelerations, and the lashing plan. For the transshipments onto local barges, stowage and lashing plans, and stability calculations were provided, followed by ballast procedures for the roll-off operations. 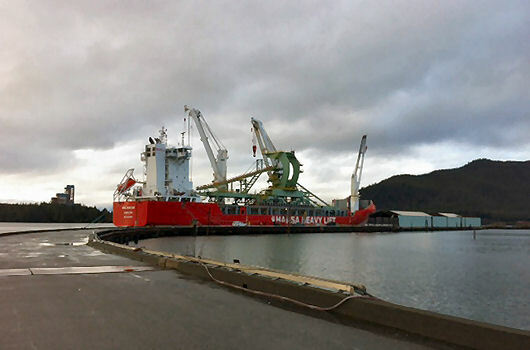 The heavy-lift ship arrived at Prince Ryupert on November 15, 2012, after which the various parts were lifted off the ship directly onto the local cargo barges. The barges were towed to the terminal and all parts where successfully rolled off using SPMTs. Photographs courtesy of HANSA Heavy Lift GmbH and Mammoet Canada Western Ltd. Provide step-by-step ballast procedures for the SPMT roll-off operations of the large parts.